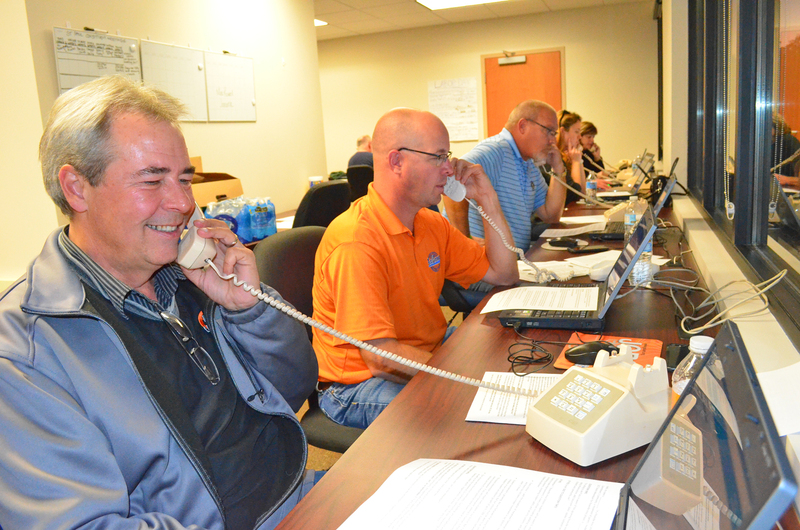 Union volunteers made phone calls in support of the Roseville school district’s bonding request at a phone bank hosted by the St. Paul Regional Labor Federation this fall. Labor-endorsed candidates performed well in municipal and school-board elections across the East Metro area Nov. 7, while voters in four large suburban school districts approved major school-funding requests that drew support from local unions. Kera Peterson, political director of the St. Paul Regional Labor Federation, which issues unified labor endorsements in local races, credited endorsed candidates for running good campaigns this fall. The three labor-endorsed candidates for St. Paul school board won comfortably. Incumbents Jeanelle Foster and John Brodrick gained re-election, and challenger Marny Xiong, a former union organizer with SEIU Healthcare Minnesota, was the leading vote getter. Labor-endorsed candidates Craig Angrimson, Art Coulson and Mike Roseen swept three seats up for grabs on the Rosemount-Apple Valley-Eagan school board. Angrimson is former president of Operating Engineers Local 35 and a delegate to the St. Paul Regional Labor Federation. In White Bear Lake, all four labor-endorsed candidates won: Deborah Beloyed, Kim Chapman, Jessica Ellison and Don Mullin. Mullin is executive secretary of the St. Paul Building and Construction Trades Council and a longtime member of the Painters and Allied Trades Union. Sean Brown, a member of the Carpenters union and the labor-endorsed candidate in a special election for South Washington County School Board, lost by just 287 votes in a tightly contested five-person race. Several school districts put requests for operating levies and capital-improvement bonds to voters in the East Metro this year, and the Regional Labor Federation endorsed referendum campaigns in six districts. Operating levy requests passed in the Burnsville-Eagan-Savage and White Bear Lake districts, but failed in the Forest Lake and Rush City districts. Voters approved bonding requests in the Mounds View and Roseville districts, but rejected a request in Forest Lake. The results in Mounds View and Roseville will inject a combined $300 million into construction projects in suburbs north of St. Paul. “These bonding initiatives are a win-win for working people in our communities,” St. Paul Regional Labor Federation President Bobby Kasper said. “They ease the constant strain on our school districts’ operating budgets and serve as a critical investment in our students’ learning environment. In municipal elections, labor-endorsed Mark Miazga won one of two open seats on the Falcon Heights City Council. In New Brighton, Mayor Valerie Johnson won her re-election bid with labor backing, and Graeme Allen, an organizer with the Minneapolis Regional Labor Federation, won a seat on the City Council.